When you have shortness of breath caused by COPD, it’s hard to imagine embarking on a regimen of pulmonary rehabilitation. After all, if you’re frequently out of breath, particularly when exerting yourself, how can you exercise? Even if you’ve been told that exercise will improve the symptoms caused by COPD, pulmonary hypertension, or interstitial lung disease, how can you perform the actual exercise you should be doing, without running out of breath before you accomplish anything? The first step is to enroll in a pulmonary rehabilitation program, where you will receive guidance, coaching, and assistance as you embark on your exercise regimen. The beauty of such a program is that it helps you manage your breathing problem as you increase your stamina and decrease your breathlessness. The program will teach you to be “in charge” of your breathing, instead of your breathing being in charge of you. Techniques you’ll learn will include pacing your breathing with your activities, proper use of your medications, and making the most of your communications with your health care provider. Best of all, when you exercise, you’ll be performing activities designed specifically for you, and the pulmonary rehabilitation staff will supervise you as you work. You’ll start at a level that you can handle, whether that means initially exercising while sitting, or getting right on a treadmill from the beginning. It all depends upon your condition and the amount of work that you can perform without becoming out of breath. The goal will be to strengthen your muscles so that over time, you’ll be able to exercise with more intensity or for longer periods of time without becoming breathless or overtired. How Long Does A Pulmonary Rehabilitation Program Last? The length of your pulmonary rehabilitation program depends upon your needs. Remember that it’s important to attend every session, because you will be increasing your exercises as you are able while the program staff monitor your performance. The more consistent your exercise sessions, the more rapid your improvement. In general, most pulmonary rehabilitation programs meet two or three times a week and last between six and twelve weeks; sometimes more. How Do I Begin A Pulmonary Rehabilitation Program? The first step is to consult with your health care provider, who will evaluate your current state of health, your lung function test results, your current activity level, and your ability to participate in the activities you’d like to do – and, perhaps most importantly, your willingness to participate and to stick with the program. What Happens When I Begin Pulmonary Rehabilitation? You will find that you have an entire team behind you, often including nurses, respiratory therapists, physical therapists, occupational therapists, psychologists, dieticians, social workers, exercise physiologists and even spiritual advisors such as a chaplain. They will all be after the same goal: putting you in charge of your breathing. The exercise you will do will be customized to match what you can do now and revised as you get stronger. Typically you will begin with stretching exercises or warm-ups, followed by arm- and leg-strengthening exercises using weights and lifting devices. Then you’ll work on improving your endurance by walking on a treadmill or in a hallway or other unimpeded space, or cycling on a stationary bike. You won’t just be told what to do and when to do it; you’ll be taught why and how your rehabilitation is working to help you breathe better and get stronger. You might attend classroom sessions, and/or one-on-one consultations with members of your health team, and you also will receive education during your exercise sessions. You’ll learn new ways to breathe during exercise and even during stressful times, and you’ll practice these new techniques during your rehabilitation exercise sessions. You’ll also learn about the best times and methods for using your inhalers and other medications. Patients are often amazed at how much exercise they can do, without becoming short of breath, after they’ve participated in a pulmonary rehabilitation program. Are There Other Benefits Of Pulmonary Rehabilitation? Most definitely! When you participate in a rehabilitation program, chances are you’ll have the chance to meet others who also have breathing problems, giving you the opportunity to share your concerns and successes with others who are living with lung disease just as you are. The beneficial effects of group support and camaraderie cannot be underestimated. Participants often have decreased levels of depression and anxiety as a result of rehabilitation. Ask your health care provider for a referral to a qualified program. The American Lung Association also can help you to locate a program in your area. If you live in or near Torrance, California, we here at LA BioMed can help you with a referral. I am on OXYGEN 24/7 3 LITER a NEBULIZER MACHINE I have SLEEP APNEA COPD with EMPHYSEMA CHRONIC KIDNEY DISEASE PULMONARY HYPERTENSION CORONARY ARTERY DISEASE had a HEARTATTACK OPEN HEART SURGERY ANEURYSM on my A ORTA n AORTA DISSECTION REPAIR. You have my deepest sympathy for having to contend with so many serious health issues! I’m sure you keep several physicians very busy taking care of you. They would have to coordinate with each other, always keeping in mind how all your problems are interrelated and can best be helped. That could not be easy. You must be a very special man, trying to keep track of all the advice and treatments given you! Of course, there is no way any internet site would be able to give you any advice other than to hang in! We wish you the best of luck and hope you are soon feeling better. When is a cure for COPD expected! This is a devastating disease amongst millions of Americans that got little attention! This disease does not seek out contributions for research and there are few facilities available. Is stem cell therapy encouraged? Thanks for your question! I don’t know where you live, but are you aware of what great strides have already been made to help those with respiratory problems? When I first got involved with Pulmonary Rehabilitation in 1976, COPD was thought to be as deadly as cancer. Now people die with COPD, not because of i, . Unfortunately, stem cells have not yet been found to be of value for COPD but many other things have been learned. For the past 35 years PERF, as an example, rather than waiting for the success of such research, has been dedicated to projects which,​ in the short​er​ term​,​​ can​ benefit patients with pulmonary disease. That is part of our mission statement. With the enthusiastic assistance of patient volunteers and dedicated professionals, we helped prove the value of pulmonary rehabilitation, exercise and oxygen. ​With our assistance, ​Pulmonary Rehabilitation was first accepted as the standard of care ​for COPD here ​in California, then​ in the rest of​ America, and now around the world. I have had the privilege of being invited to many countries to help start pulmonary rehab programs and demonstrate the value of exercise and oxygen. Dr. Casaburi​, the President of PERF, is lecturing in a pulmonary conference in Europe, sharing information with other health professionals, as I write this​. He, as well as other ​wonderful ​ physicians​,​ continue to lecture all over the wor​l​d at​ such ​conferences​,​ ​designed to ​increase knowledge on how to help those with COPD. Do you know how many countries ​also ​send physicians here to LA BioMed learn about these things? They ​often ​visit local pulmonary rehab programs ​while ​here so they can return ​home ​with ​helpful knowledge to countries around the world​ coping with the problems of pulmonary disease mostly caused by smoking. ​But you are right. Research in COPD is underfunded, given ​the tremendous impact​ of this disease​. PERF, like several other organizations, tries to get better funding, but it is very difficult in today’s ​​political​ world with so many decisions about where to best spend money. ​That doesn’t mean we have given up! 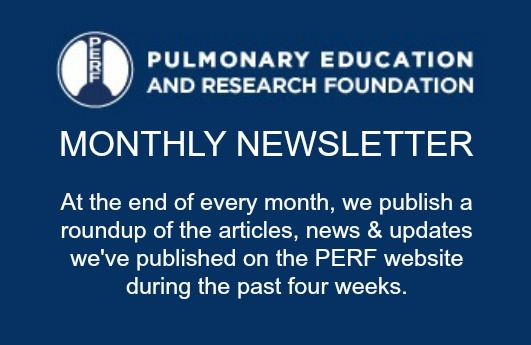 The pulmonary community is continuing to do all it can to learn more, and to spread this knowledge around the United States and the world.